Catenary Testing Ltd have developed a technique for the calibration of tension meters to improve mooring safety on semi-submersible oil rigs. The method relies upon the fact that tight moorings allow less movement than slack ones. Following initial computer simulations, which proved the technical viability of the method, a scale model rig (see Fig. 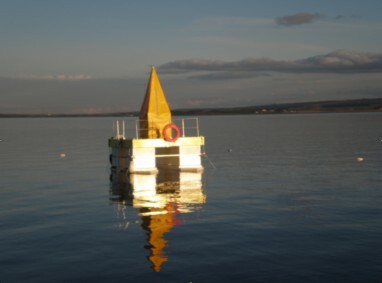 1 below) was constructed for testing in the inner Moray Firth near Inverness. The data logging equipment present on the "mini rig" included a motion sensor, load cells connected to each anchor line and a RTK receiver. The bespoke loadcell circuit was designed to transmit data from the eight load cells at a rate of 8 Hz. The company therefore required a serial data logging application that was capable of receiving and processing that volume of data in addition to the data received from the RTK and motion sensor. After several unsuccessful trials with other serial data logging packages, they came across the Windmill website and purchased the Windmill + COMIML Serial Driver. They were able to use this software to parse the output strings of all data logging equipment on the rig. This was a great benefit as the RTK and motion sensor were transmitting ASCII characters, while the loadcell circuit was outputting binary strings. Another requirement was that the logged data was accurately timestamped. Other RS232 loggers looked at used the Microsoft Windows serial driver. This is incapable of logging data at the rate required, and is affected by other Windows processes running which can introduce varying delays to data acquisition. Windmill Software write all their own drivers, so the other benefit of Windmill was that it allowed them to log at their required rate and to precisely timestamp the data. The data gathering phase of the project is now complete and the company have significant volumes of data to analyze and interpret in order to prove the theory in practice on a small scale. Early results look encouraging and the next stage is to test the technique on a full size, offshore moored installation.